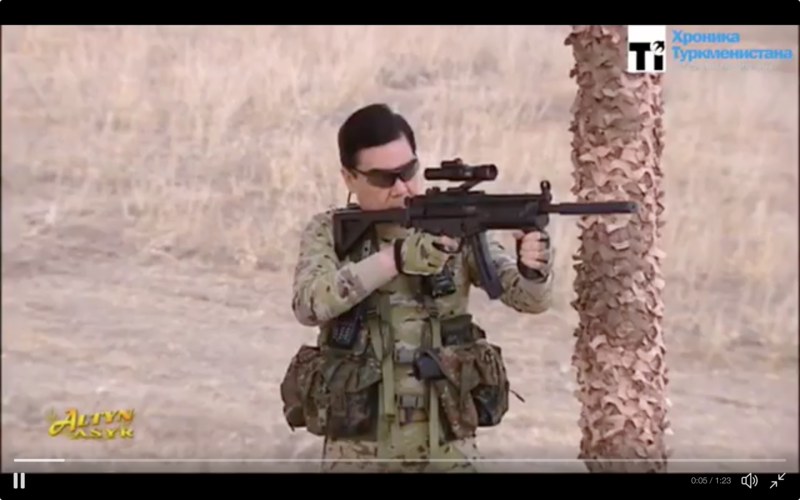 Turkmenistan’s president has added to his increasingly idiosyncratic repertoire of public personae with a turn as a deadly gun-toting, knife-wielding commando. Gurbanguly Berdymukhamedov performed his routine of one-handed pistol shooting and dagger-throwing during an inspection of troops on August 1 at a border station south of the capital, Ashgabat. TV footage helpfully captured, and embellished with footage and music from Arnold Schwarnegger’s 1985 classic Commando, by the Chronicles of Turkmenistan website shows a steely-gazed Berdymukhamedov in shades demonstrating the use of an automatic rifle to what appeared like regular troops but were, in fact, the heads of the military, police, security services, prosecutor’s office and customs service, among others. “Picking up one of the types of weapons presented to him, the head of state demonstrated the precision of his aim, which served as evidence of his high level of military preparedness,” the state news agency gushed. For what’s it worth, the targets in question are very clearly shown not to be distant at all, but such wild exaggeration is par for the course in Turkmen state media. It is not immediately clear what Mulikov is supposed to have done wrong, but there is every chance that Berdymukhamedov is in a state of profound anxiety about preparations for the 5th Asian Indoor and Martial Arts Games, which will take place over 11 days in Ashgabat in September. Mulikov had reported on his ministry’s activities to ensure public order, road safety and combat drug-trafficking, but this was evidently not deemed enough. The timing for this faintly ridiculous public relations exercise is curious as it comes in the wake of reports from RFE/RL’s Turkmen service of four suspected Islamic State militant being captured in the southeast of Turkmenistan after crossing over from Afghanistan. Radio Azatlyk’s source in the Defense Ministry stated on condition of anonymity that the four suspected militants were citizens of Turkmenistan and had been involved in fighting in Syria and Iraq. The same military source, who said he participated in the operation to capture the militants, said dozens of other fighters have trickled into Turkmenistan in recent months. Quite how much of this can and should be believed is all but impossible to establish since the Turkmen government exercises complete secrecy over security-related issues. Turkmenistan is not known to have a recent history of Islamist-inspired insurgency on an even a small scale. What is more certain, however, is that the turbulence in Afghanistan has extended to regions bordering with Turkmenistan. The poorly defined and shifting border between the two countries would make it relatively straightforward for determined militants to make the crossing, although the intensity of state security service surveillance within Turkmenistan means any outsider could hardly hope to evade detection for long in a residential area. Berdymukhamedov’s clownish posing with guns is intended presumably to convey the message that Turkmen forces are more than ready to cope with any threat, but the evidence for that untested proposition too is scanty.